Commercial shipping is a crucial part of the world’s infrastructure – ships carry everything from high-tech electronics to basic foodstuffs. The industry accounts for 3 percent of all annual global emissions, so it makes sense to make shipping as efficient as possible. With that in mind, Japanese company Eco Marine Power has devised the Aquarius Eco Ship, which harnesses the power of the wind and sun to lighten its environmental impact. We have previously covered Eco Marine Power’s plans to develop solar EnergySails for large ships, but their new concept aims to go even further. It will feature the Aquarius MRE System – an innovative fuel-saving, emission-reducing technology that incorporates a variety of elements including solar panels, energy storage modules, a computer control system and an advanced rigid sail design. Eco Marine Power’s system is fascinating because it is designed to be highly flexible and configurable, so it can installed on a variety of ship sizes and types. This means that bulk carriers, tankers, survey ships, passenger ferries, and even unmanned surface vessels can all be fitted with the system. The company has also proposed fitting ships with other fuel-saving measures such as advanced electrical propulsion systems, optimized hull designs, and waste heat recovery technologies. It is estimated that a combination of all of these technologies could lead to fuel savings of 40% or more while reducing the emission of noxious gases such as Sulphur Oxides (SOx) and Nitrogen Oxides (NOx). It goes without saying that the vessel’s carbon footprint would also dramatically shrink. @Anothervoice : Masted ships aren't any good. They tilt too much. And (off-)loading is a pain because the masts are always there and thus always in the way. A MUCH better suggestion is to use SkySails: http://en.wikipedia.org/wiki/SkySails Those can use the much stronger winds that are at a higher altitude, tilt the ship a lot less and don't interfere with loading and offloading of goods. With all of our computers, satellites and parametric analysis I'm guessing a classical masted ship with solar sails could be fully competitive in today's market. Maybe even more so when you factor in the fuel cost relief of wind and solar. Fossil fuel maybe only for emergency backup. Batteries for in-port navigation and docking. I am anxiously awaiting the day. Commercial shipping is a crucial part of the world’s infrastructure - ships carry everything from high-tech electronics to basic foodstuffs. The industry accounts for 3 percent of all annual global emissions, so it makes sense to make shipping as efficient as possible. 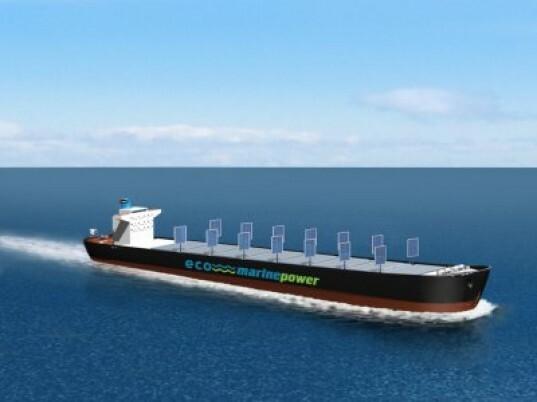 With that in mind, Japanese company Eco Marine Power has devised the Aquarius Eco Ship, which harnesses the power of the wind and sun to lighten its environmental impact.